Enough people have asked the question "which regulator" so here is the relevant post about it. If you have used others then feel free to contribute along with your experiences with them. This includes the good and the bad. Palmers are well known already. Custom Products Grip Regulator is a low pressure 0-500psi reg. Before purchase make sure that it is not upgraded to the heavy spring pack which works at 200-600psi. Evil Detonator- ** note: this is a very affordable regulator that is LP capable. However it requires a much greater break in period before the shim stack stabilizes. Average being 2000 with a max of 4k. MagnumBB Cold Shot Kit- complete no hassle double regulator kit. I was wondering if you can attach a pressure gauge on any of these regulators? Or do they all support that? Cause I am planning on getting the AKA 2Liter (Low Pressure of course) Model. But I'd like to be able to see the PSI pressure that I put into my Airsoft gun. And would a "12 gram Quick Change" screw right onto the regulator? I'm trying to make a CO2 System with CO2 Cartridges that is as compact as possible. So it would be great if the regulator is right next to the 12 gram Quick Change. And would an ON/OFF Switch between the 12 gram Quick Change and the AKA 2Liter regulator make any sense? Yes, it will allow for a gauge to be attached. Like many it has a port that is blocked by a removable 1/8 hex nut. Remove the nut (be sure to check and clean the threads inside for any left over sealant) then install your gauge. The 2 liter only has a 1/8 input port so you'll have to run the 12gram cylinder and reg parallel just like in my guide. Actually your setup will look exactly like mine. Surprisingly I hear the question about putting an on/off between the reg and Co2 source alot. The answer is always the same. While you can do it, the reg and remote hose are still pressurized even if the Co2 source has been shut off. Beside the chance to lose a Q/D o-ring its really really inefficient for 12grams as it has to use up alot of gas just to repressurize the reg and hose. An on/off is always better at the end of the hose although it can be bulky. MagnumBB used industrial regulators to make the ColdShot which are not as exacting as robust paintball regs. By using two regulators he was able to reduce the huge 850psi down to an acceptable level. With that hard part over (going from 850psi to 120psi and keep the output at +/- 2psi is hard) the second reg was able to put out a precise pressure while keeping the entire kit cost effective. It was really a well thought out concept and I would have loved to have seen it progress further (he was always improving it based on feedback) but due to Paypal scammers/customers we won't see it happen. Don't be afraid to ask questions. Very little in known publicly about gas systems as opposed to spring systems making it hard for many to find good info. The more people know the more they can help out others stepping into this realm. Good news about the pressure gauge! I really wasn't sure if you could just "screw" one onto the regulator. Now I'm wondering what pressure gauge I can screw onto the regulator? does it make any difference if it's from 0-300 or 0-400psi? Will the pressure gauge always give the right pressure? Or do I absolutely need a pressure gauge that goes from 0-350psi because this is the psi-range the regulator would be adjustable? Thank for all this great help! This is really helping me A LOT! Whoa, hold on a sec there. Clarify your statement about your "regulator screw". Regulators don't have an on/off screw. If want to remove any pressure from the system you have to remove/unscrew the gas source from the rig. Hold on a sec. I goofed on this one. I rechecked the website and some other sources. Looks like the 2-liter did away with the two port design that is common on many other regs. Instead AKA offers an ASA connector with gauge for $30. You put it between the reg and remote hose to check it's correct output pressure. This isn't that bad of a thing since you won't need the gauge hanging off your rig thus slimming down the profile and the price isn't that much more. You could always buy your gauge and then rig up your own inline pressure tester using a 1/8 brass tee fitting and a male/male coupler. *Note: this is all from ACE Hardware and you can find the same fittings in any hardware shop in the US. The items listed I took from the site with no real searching. Those are bulk orders, not single items. If you order from these links you'll get 10 of them. Same as I have on mine. Some 2-Liter's come with a 90degree macro-line fitting. You remove that and replace it with a 1/8 pipe thread on both sides. That puts your air source and 2-liter side by side (parallel) and takes up the least space. Imagine I play a game. At the end of the day I still have some CO2 left in my tank and system. So I wouldn't want to unscrew the tank, because I'd lose the rest of CO2 that remains in the tank. Now I can imagine that putting my CO2 mag (and the CO2 system attached to it) away for a few days without letting out the pressure out of the mag won't do my mag an good. So I thought adding an ON/OFF switch between mag and tank would make it possible to cut the connection. So I can let out the resting pressure that is in the mag by firing 2-3 "empty" rounds. Now IF the regulator is capable of not letting through ANY co2 when completely unscrewed then I wouldn't need an ON/OFF Switch, because the regulator can completely block the connection. Me writing "unscrewing" means: turning the regulator "screw" that sets the pressure. 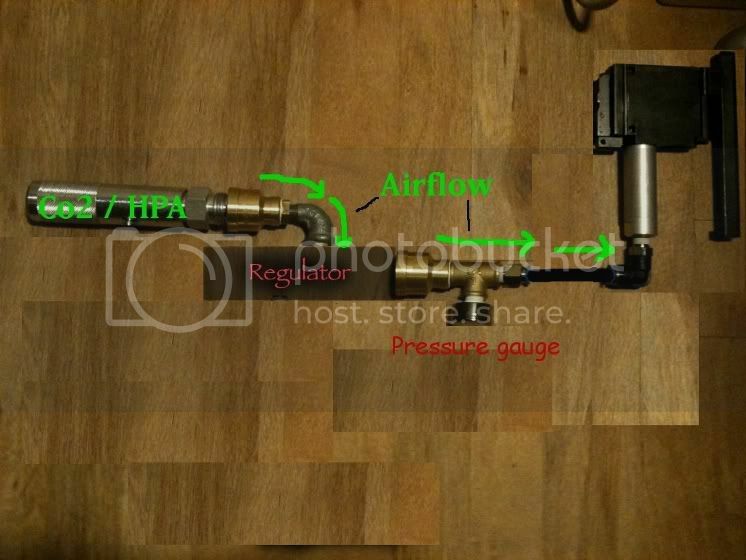 Basic question: Does the AKA 2Liter regulator, when set to 0psi, really stay closed? Or would an ON/OFF Switch be needed for that? The ASA 2-Liter regulator doesn't support a possibility to attach a gauge immediately onto the regulator? So to be able to "see/read" the pressure going into the mag I would absolutely need the AKA pressure tester that you linked in your last post??? The regulator is not made to be an on/off valve. If your adjust the pressure to 0 psi it might not fully stop the flow of gas from leaking out. It will put un-necessary wear and tear on the o-rings and seal inside your regulator though and even damage it. If you use 12 gram capsules/caplettes then every single one of them should be considered "expended" when you activate them. There is no point in trying to save the air inside of them. The only other air option I would recommend are the refillable 12oz - 20oz tanks. These have a pin valve that shuts off the air when it's unscrewed. They do not leak it all out. The same applies for high pressure air (HPA). Yes, it looks like the 2-Liter does not have a gauge port built in. Many new paintball are being made like this now since many paintball guns already have gauges built on the gun. The 2-Liter is still one of the best regulators on the market though. Yes, you either need to buy the AKA pressure tester or you need to make one which I gave instructions for in the last post. Ok thanks for your great help! I ordered the 2liter Regulator yesterday. I'll make my own "Gauge setup" with those parts you linked further up. Yes, standard paintball fittings are all 1/8 including the gauges. First, you have to know where the air goes. For the 2-Liter the air goes in the side and out the top. I took your picture and re-arranged it so that it is properly configured. Remember, follow the air flow. It starts at 850psi where it says Co2/HPA. Then moves to the regulator. The regulator turns it into 100-150psi depending on how hard you want to shoot. The air then exists and pressurizes everything from the T-fitting to the magazine. Teaching: Remember that last sentence about pressurizing everything. It's about efficiency. For those that use long coiled remote lines, the entire remote line has to be pressurized to 100-150psi. That uses more air. Your macro-line is small and does not need much air. So you will get more shots from your 12gram capsules. If you or a friend decides to use a long remote line and they wonder why they get fewer shot, now you know why. Oh and thanks for the info about the nr of shots with a longer-shorter connection to the mag! Very good to know! You mean a "Stabilizer". The "Rock" is a low pressure regulated piston for the Autococker series of paintball markers that :censored2: the gun. You mean a "Stabilizer". The "Rock" is a low pressure regulated piston for the Autococker series of paintball markers that :censored2: the gun. Wouldn't want the rifle to start going into convulsions. Break in requires the spring washer pack to be flexed open and closed. Believe it or not, if you compress a spring for a year it will spring back into position with no change as long as no extreme heat or cold has affected the metal. You'll need to get the pressure up to a decent level (50 is good but 75 is better) and then open and close a release valve after the air has passed through the reg. Easier way is to rent a paintball gun and hook your reg up to it then fire off a tank worth even if its dry firing. Some places will do it for you if you ask. Any help us greatly appreciated. The regulator setup in the video was the Coldshot Kit by a user here named MagnumBB. It had a limited run and he's no longer making them. Unfortunately, pre-constructed air rigs that go that low are few in number. The Firebase and the Palmers setups are the only pre-constructed that I can think off off the top of my head. The Palmers is the cheaper of the two. Building your own gives you more options and can put your budget a little over $100. Less if you find a used or discounted regulator. Some guys have pull HPR's off of paintball guns like the Etek 3 or have even used ANS Jackhammer LPR's from Autocockers with great success. Right now I think the AIM inline might be the cheapest brand new. I found the following post where a guy used one to hook up a 3k tank to a nerf gun set to 70psi. The process is still the same and we run slightly higher pressure which isn't a problem (the AMI is 0-600psi adjustable).